Be the first to share your favorite memory, photo or story of Heide. This memorial page is dedicated for family, friends and future generations to celebrate the life of their loved one. 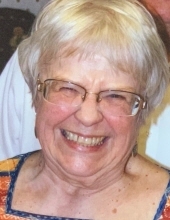 Heide Georgine Niemann Clausnitzer, of Brighton, passed away in the loving care of her family on February 8, 2019. She was 82 years old. She cheerfully served in many roles; daughter, sister, wife, mother, grandmother, great-grandmother, friend, confidant, spiritual advisor, business-woman, activist and philanthropist. If you knew her you couldn’t help but love her. She was generous, kind, spiritual, smart, principled, courageous, modest, musical, funny, stoic, a community organizer before we ever learned that term - and ever the champion of anyone who was vulnerable and needed an advocate. Heide was born in 1936 in Mannheim, Germany and raised during Nazi Germany's Third Reich. As a child she saw the effects of war first-hand. The perils of war would give her a compassion and empathy that would govern her entire life. Heide married her childhood sweetheart, Joachim (Jack) Clausnitzer, following his assignment to their hometown serving in the US Army. Jack was Brighton’s first Exchange Student in 1952, and he was eager to return as a new US citizen. They crossed the Atlantic via ship and arrived in New York City with a VW Bug, some books and their infant daughter, Susanne. The new Brighton family grew with Tim and then Tom; and eventually, young Helen was welcomed. Jack and Heide started their own business based on new numerical control (NC) machining technologies with close friends, Dave and Shirley Barton and John and Joyce Ewing in 1965. Brighton NC Machine (BNC) has employed hundreds of people over the years, and is still owned by the Barton and Clausnitzer families. Heide was a long-time Sunday School Teacher, Children’s Choir Leader and Deacon at the First United Presbyterian Church. She worked at Rickett School and at LESA with developmentally challenged children, and eventually became one of the founders of LACASA, where she served as the Children's’ Program Coordinator. She also served on the Domestic Violence State Board as a consultant advocating for children’s services. Heide loved spending time with her friends through church activities, volunteering for Gleaners, Questers, wool rug hooking, cooking & baking and gardening. Heidi and Jack contributed to many organizations including LACASA, Gleaners Food Bank, Oxfam and Heifer International. With dear friend and BNC co-owner Shirley Barton, they started a community “Victory Garden” at BNC for Gleaners, which still exists today. Heide was preceded in death by her husband of 62 years, Jack, in June 2018. She is survived by her children, Susanne Clausnitzer, Helen (Mark) Seger Lally, Tim (Norma) Clausnitzer, and Thomas (Cheryl) Clausnitzer; grandchildren, Katelyn (Lindsay Steele) Cooper, Samantha Cooper, Benjamin (Jordan) Rosenau, Jacob (Alex) Rosenau, Steven (Joanna) Clausnitzer, Andrew (Ashley) Clausnitzer, Callie (Ryan) Sullivan, Kyle Clausnitzer, Drew Clausnitzer, Scott Clausnitzer, Jamie (James) Randall, Amanda (Aaron) Ambinder, and Lacey Campbell; 14 great-grandchildren and one on the way; sister-in-law, Marianne Niemann; longtime friend and business partner, Shirley Barton as well as many extended family and dear friends. Heide was preceded in death by her husband of 62 years, Jack, in June 2018. She is survived by her children, Susanne Clausnitzer, Helen (Mark) Seger Lally, Tim (Norma) Clausnitzer, and Thomas (Cheryl) Clausnitzer; grandchildren, Katelyn (Lindsay Steele) Cooper, Samantha Cooper, Benjamin (Jordan) Rosenau, Jacob (Alex) Rosenau, Steven (Joanna) Clausnitzer, Andrew (Ashley) Clausnitzer, Callie (Ryan) Sullivan, Kyle Clausnitzer, Drew Clausnitzer, and Scott Clausnitzer, Jamie (James) Randall, Amanda (Aaron) Ambinder, and Lacey Campbell; 14 great-grandchildren and one on the way; sister-in-law, Marianne Niemann; longtime friend and business partner, Shirley Barton as well as many extended family and dear friends. Memorial Gathering will be held at Lynch & Sons Funeral Home, 600 E. Main St., Brighton, on Wednesday, February 13, 2019 from 4—8 PM. A Memorial Service will take place at First Presbyterian Church, 300 E Grand River Ave, Brighton, on, Thursday, February 14, 2019 at 11 AM with gathering beginning the hour prior at 10 AM. Memorial Contributions can be made to: LACASA or Gleaners. 2895 W Grand River Ave.
"Email Address" would like to share the life celebration of Heide Georgine Clausnitzer. Click on the "link" to go to share a favorite memory or leave a condolence message for the family.